Make your own homemade Wedding Invitations. Gather your bridal party together along with some scissors and glue and make it into a fun night of creativity. 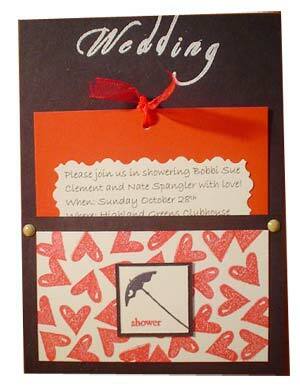 Keep your theme in mind when thinking of suitable designs for your invites. Umbrellas seem to be a popular feature for Showers of any kind so you might find a rubber stamp or a clipart image that you can incorporate into the design. Get ideas to make your own beautiful invitations to wow your guests. You will love the feeling you get from creating your own custom made invitations as have all our diy brides. 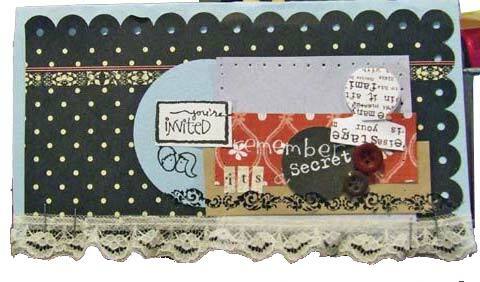 A funky little wedding shower invitation made by Kim in a very eclectic style with lots of mixed elements and stamping. Just perfect for the fun young and out of the box type couple that she had in mind when she created it. There is a mixture of patterned scrapbook paper and colored cardstock, some rubons and rubber stamps have been used and lace trimming, . There is some machine sticthing and lots of hand stamped images... Simply beautiful. Made these for my cousin who couldn't find anything in the stores that she liked. I think they turned out great! Submit your Unique Wedding Shower Invitations Design and tips here.